“When we think of mental health we often think of emotional difficulties and mental health problems and how we can resolve a crisis once it has occurred. This thinking demands an investment after the fact or ‘downstream’. ‘Upstream’ thinking means investing wisely for future success and addressing the broader determinants of mental health at a population level. We view mental health as a resource for all that requires a whole-of-government and whole-of-society approach. Although there is evidence to support an ‘upstream’ view, our current investment in policies and practice is ‘downstream’ and we will need a change in public and political support to think and invest differently.” – ASI 2017 keynote speaker, Professor Margaret Barry, WHO Collaborating Centre for Health Promotion Research, National University of Ireland, Galway. Raising healthy children is a responsibility of all Canadians. Supporting and promoting child and youth mental health is central to enabling them to become life-long, positive contributors to their communities and society. Strengthening policies and programs that support positive mental health for children and youth is vital to creating a sustainable and inclusive Atlantic Canada. The Atlantic Summer Institute on Healthy and Safe Communities (ASI) has provided an Atlantic platform for inter-sectoral collaboration to promote child and youth mental health in the region. ASI hosted a Symposium on Child and Youth Mental Health Promotion in 2015 to bring together a broad range of groups – public, non-profit, academic and private sectors, including education, health, community services, justice and community organizations – to find ways to have a collective impact to improve child and youth mental health. The emphasis is on mental health promotion, through upstream investment for downstream benefits. Building on the momentum from the past 2 years of ASI programming, which focused on emerging evidence and best practices that promote positive child and youth mental health in schools and communities, ASI 2017 was designed to generate a Call to Action based on evidence for polices, programs and best practices discussed and showcased at the event. Two documents have been developed to inform discussions, an Atlantic Profile of Child and Youth Mental Health and a Backgrounder on Child and Youth Mental Health Promotion that has compiled research and evidence from a variety of sources to inform policies, programs and practices that support child and youth mental health. The first public draft was posted on the ASI website in mid-July 2017, with communications going out to draw attention to it. 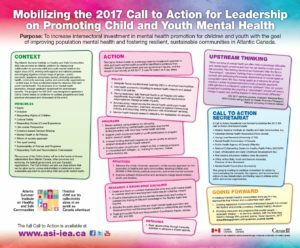 A draft Call to Action was developed during ASI 2017. This updated Call to Action emerged from further consultation with participants at ASI 2018. The success of this Call to Action will be in the hands of diverse stakeholders from Atlantic Canada, other provinces and territories, the federal government, and pan-Canadian organizations. Below we set out clear actions that can be taken up by various stakeholders to implement a more sustainable approach to promoting child and youth mental health. The goal of the Call to Action is to build on existing efforts to create a more sustainable approach to promoting child and youth mental health in Atlantic Canada. Catalyze concrete, cross-sectoral responses for mental health promotion. Influence decision making in Atlantic Canada and across the country. We are using these principles as guideposts to action. Detailed definitions are in the Backgrounder. This year is a defining moment for Canada and its many nations. The Report of the Commission on Truth and Reconciliation is the ultimate call to action, and perhaps the most pressing. There are many other organizations at the national, regional and provincial levels that are focusing on child and youth mental health. This Call to Action builds upon and makes strategic links to many existing provincial, territorial, and pan-Canadian strategies and policy reports. The Backgrounder prepared for this event provides a comprehensive overview of the evidence base that we are drawing on for this Call to Action. A few highlights are presented here as context for the actions outlined below. First Nations Mental Wellness Continuum Framework(2015) – Assembly of First Nations, Health Canada’s First Nations and Inuit Health Branch, the National Native Addictions Partnership Foundation, Native Mental Health Association, and other community mental health leaders. Mental Health Summit: Mental Health Promotion and Mental Illness Prevention for All(2012). Hosted by Government of Manitoba and Healthy Child Manitoba. Mental Health Summit Follow-up:Think Tank Proceedings Report (2013). Public Health Agency of Canada, Mental Health Commission of Canada, Manitoba Mental Health and Spiritual Health Care, and Healthy Child Manitoba. Maximizing Social Impacts and Returns on Investment: Towards a Sustainable Prevention Infrastructure for Population Mental Health Promotion and Mental Illness Prevention in Canada (2014). Mental Health Summit Network. Population Mental Health Promotion for Children and Youth – Topical Papers and Resources(2017) National Collaborating Centres for Public Health. Positive Mental Health Toolkit, 2nd Ed. (2016), Pan-Canadian Joint Consortium for School Health. The SEAK (Social and Emotional Learning for Kids) Project, funded by the Public Health Agency of Canada. Positive Population Mental Health Surveillance Indicator Framework for Youth (2017). Public Health Agency of Canada. All of these reports are pieces of the puzzle of child and youth mental health promotion. Taken together, a clear picture emerges. The Backgrounder puts them all together in one place for all to view. This Call to Action builds on the Mental Health Summit Network report, which outlines ways of building capacity for collective impact, choosing approaches for sustainable system transformation, advancing evidence on returns on investment for mental health promotion, promoting existing best and promising practices upon which future efforts can build, and implementing and sustaining programs, practices, and policies for promoting child and youth mental health. The success of this Call to Action will be in the hands of diverse stakeholders from Atlantic Canada, starting with the premiers of the four Atlantic Provinces, the Council of Atlantic Premiers (CAP), other provinces and territories, the federal government, and pan-Canadian organizations. Below we set out clear actions that can be taken by governments, NGOs, researchers, and other stakeholders to implement more sustainable policies and programs for promoting child and youth mental health. ACTION 1: For effective implementation of effective SEL programs, integrate them into school curricula. ACTION 2: Increase accountability by using health economics modelling to assess health impacts and related costs of all policies. ACTION 3: Have a dedicated, fully financed Health in All Policies Unit within departments responsible for mental health and hold departments responsible for managing health impacts. ACTION 4: Educate policy makers to use the mental health continuum model (prevention, promotion, treatment, recovery), and other mental health frameworks, to support intersectoral policies and resourcing, linking upstream with downstream services. ACTION 5: Monitor health impacts research related to the legalization of cannabis. ACTION 8: Increase investments in community-based promotion and protection of mental health in children and youth, and encourage flexible and sustainable funding for community organizations to respond to local needs, and to shift from small-scale projects to long-term programs. ACTION 1: Find ways of linking evidence for mental health promotion and mental illness prevention with front-line mental health services. ACTION 2: Create and promote un-siloed system navigation services/supports to help children, youth, and families to access and navigate programs and services across the continuum. ACTION 3: Support youth voice and insist on youth participation in program and/or research design. ACTION 4: Increase funding and build capacity for not-for-profits to conduct program evaluation and impact research. ACTION 5: Develop and scale up a holistic wellness community pilot project within each of the four Atlantic Provinces, to assist entire communities in assuming a child-centered and sustainable approach to mental wellness. ACTION 6: Implement peer helping networks in schools, as well as school safety plans for students experiencing mental health challenges. ACTION 7: Develop a resource hub for individuals, organizations, and government departments to access materials that respond to their diverse needs, including information on sustainable funding opportunities. Explore pursuing this by way of a co-op model. ACTION 8: Utilize a strengths-based approach to community programming, which builds on community assets, bridges silos, and enhances community and inter-agency collaboration. ACTION 9: Engage and empower service users, by involving them in the conversations with service providers and decision-makers. ACTION 10: Increase the focus of programming on environment-level factors, as opposed to individual-level factors that impact child and youth mental health. ACTION 11: invest in public spaces where groups can gather and foster connections. ACTION 1: Advance the whole-of-person approach for the promotion of healthy and safe communities, situating children and families in their social, political, economic, and environmental contexts. ACTION 2: Improve outreach of prevention and services to marginalized children, youth, and families. ACTION 3: Invest in paid peer support. ACTION 4: Build a Community of Practice for promoting child and youth mental health, including through involving the community and people with lived experience; getting to know community realities; sharing space, language, and culture; and promoting inclusion. ACTION 5: Be humble, create safe spaces for learning, be careful not to shut people down, and be comfortable asking questions. ACTION 6: Ground the education and training of professionals in the lived experience of the social determinants of mental health and sustainable development goals. ACTION 8: Increase awareness of the jurisdictional landscape within which programs and policies are being implemented, with regards to needs, priorities, and context. ACTION 9: Bring a diverse people together to exchange ideas and perspectives, particularly Indigenous, youth, and newcomer perspectives on addressing child and youth mental health. ACTION 3: Work alongside children and youth as experts of their own lives. ACTION 4: Develop and promote multi sectoral indicators of mental health and its determinants. ACTION 5: Use common indicators to measure short term and long term collective impact. ACTION 6: Create and report on common indicators for child and youth mental health and frame outcomes within a rights-based approach. ACTION 7: Create interdepartmental and inter-jurisdictional agreements to share data and indicators that illustrate factors that contribute to mental health. ACTION 8: Increase support for diverse research methodologies, including community-based and participatory action research. ACTION 9: Promote economic literacy for people to better understand macro-economic, structural issues that impact mental health. ACTION 10: Create a clearinghouse and a sustained infrastructure and funding to maintain the sharing of data and knowledge in the Atlantic region and beyond. Work with other models and existing networks. ACTION 11: Educate the public about child and youth mental health promotion and illness prevention and the long-term benefits to communities and society. ACTION 12: Improve data collection and sharing across jurisdictions by enhancing training, increasing funding, building infrastructure in adherence to national and global standards. ACTION 13: Improve public reporting on child and youth mental health indicators, including positive mental health indicators, on a regular basis. ACTION 14: Enhance partnerships between academia, communities, and the public sector to strengthen data collection, research, and data sharing. ACTION 15: Read and support Truth and Reconciliation Commission Report, articles #57, #62, and #66. ACTION 16: Assess what information has been collected with regards to whole of society approaches child and youth mental health over the past 5 years, and share programs, frameworks, initiatives, and ideas with the Atlantic Provinces to better distribute the usage of time and resources. ACTION 17: Look for intersectoral examples and frameworks that converge with the Call to Action, and how it can support its implementation, such as a framework piloted with the Canadian Partnership for Children’s Health and Environment. ACTION 18: Equip parents with the appropriate tools for responding to their children’s’ mental health needs, for instance through Mental Health First Aid. ACTION 1: Introduce yourself to someone you don’t know in another sector that can contribute to your work. ACTION 2: Seek opportunities through networks activities to advance a shared agenda. ACTION 3: Use network mapping tools to understand and expand your network, and follow through with opportunities. ACTION 4: Enhance dialogue on child and youth mental health by engaging parents, youth, Indigenous elders, policy makers at all levels of government, service providers, faith-based organizations, people and sectors outside the areas of mental health (e.g. housing), and other stakeholders, including through interprovincial collaboration. ACTION 5: Engage media in the discussion on child and youth mental health. ACTION 6: Seek out strong leadership, educate communities, and identify where and how to harness intersectoral work. First Nations Mental Wellness Continuum Framework (2015) was developed through collaboration between the Assembly of First Nations, Health Canada’s First Nations and Inuit Health Branch, the National Native Addictions Partnership Foundation, the Native Mental Health Association, and other community mental health leaders. The Framework identifies ways to improve service delivery to First Nations and provide culturally-safe supports. We can learn from First Nations and use this framework for working together to promote child and youth mental health for all Canadians. Key themes from this framework woven into the ASI program are: leadership, cultural ways of knowing, resilience, strengths-based, across the life span. Mental Health Summit: Mental Health Promotion and Mental Illness Prevention for All (2012) led by Healthy Child Manitoba, the summit drew more than 300 delegates from across the country, including service delivery, policy and research, as well as representatives from provincial, territorial, Indigenous, federal governments, and national organisations. The post-summit report proposes a blueprint for a “pan-Canadian framework for the collaboration, implementation, scale up and sustained commitment to evidence-based mental health promotion and mental illness prevention.” Key concepts and themes from this report woven into the ASI program are; life course approach, collective impact, evidence-based implementation, and equity. Mental Health Summit Follow-up: Think Tank Proceedings Report (2013). Public Health Agency of Canada, Mental Health Commission of Canada, Manitoba Mental Health and Spiritual Health Care, and Healthy Child Manitoba. The goal of the Think Tank was to identify and recommend those mechanisms which not only facilitate the exchange (communication) of evidence among and between jurisdictions, but which also provide support for the development and scale up (“the how”) of MHP-MIP innovation and best practices within and across respective Canadian jurisdictions. It provides a blueprint for successful scale-up of effective mental health promotion-mental illness prevention innovations and best practices. Maximizing Social Impacts and Returns on Investment: Towards a Sustainable Prevention Infrastructure for Population Mental Health Promotion and Mental Illness Prevention in Canada (2014). Mental Health Summit Network. Provides a pan-Canadian framework for the collaboration, implementation, scale-up, and sustained commitment to evidence-based mental health promotion and mental illness prevention. Population Mental Health Promotion for Children and Youth – Topical Papers and Resources (2017) was published by the National Collaborating Centres for Public Health (NCCPH). This project addresses a need for resources to help clarify terms, concepts, roles and responsibilities related to population mental health promotion. Key concepts from this series woven into the ASI program are: life course approach, health equity, indigeneity and diversity, population health promotion. Positive Mental Health Toolkit, 2nd Ed. (2016), developed by the Pan-Canadian Joint Consortium for School Health, is comprised of five online modules that have been updated to reﬂect recent Canadian research, and to identify promising practices occurring in diverse contexts across the country. The PMH Toolkit also provides a means of measuring positive mental health practices. Key concepts from this toolkit woven into the ASI program are: strengths-based approach, social and emotional learning, resilience, connectedness. The SEAK (Social and Emotional Learning for Kids) Project, funded by the Public Health Agency of Canada (PHAC), has created a vision document that represents the input of a cross-section of leaders, decision-makers, and practitioners who share a commitment to social and emotional learning (SEL) programs across Atlantic Canada. Building on the PHAC Innovation Strategy’s program design, the document offers a detailed strategy for inter-provincial collaboration to scale up SEL programs in Atlantic Canada. Key themes from this report woven into the ASI program are: leadership, scale up, whole school approach, strengths-based, equity, partnerships, teaching and learning. Positive Population Mental Health Surveillance Indicator Framework for Youth (2017), produced by PHAC, provides a comprehensive national framework captures high quality information about risk and protective factors affecting mental health outcomes for youth (12-17 years) across four related domains. The 26-indicator framework was developed in consultation with stakeholders working in mental health surveillance, programs and policy. It will continue to evolve as new data becomes available. State of the Child Report 2016 – New Brunswick: The eighth annual report is the undertaking of the Office of the Child and Youth Advocate. It contains more than 200 data indicators, based on a child rights and well-being framework. The 2016 report focuses on children’s mental health. It is notable for its comprehensive look at factors that build resilience, while also examining persistent gaps and risk factors for positive mental health in children. It is a strong example of a good practice. Organizations are now being listed in the ‘who’ section under each action. Comment here or contact us directly to add your commitment to the Call to Action! Thank you for your feedback on this Call – it’s a “living document”! Your comment is very good one, which is being taken forward to the Writing Team. We appreciate your contribution! In the principles section, the principle of a « whole family approach » is lacking, despite all the recent evidence supporting whole family approaches in intervention. Related to that, it is surprising and shocking that nowhere in this call to action the words “sibling”, “parent” , or “caregiver” are mentioned… How are young going to promote children and youth mental health without specifically involving parents, grand-parents and siblings? As a result of this, this call to action doesn’t mention the experiences and needs of young carers (caregivers) and of children and youth living with a family member with mental illness such as a parent or a sibling despite that this issue was addressed during one of the presentations (in session Session 4: Parent, Caregiver and Mentor Engagement) and despite all the evidence of the impacts mental illness in the family can have on children and the interventions developed towards those children elsewhere. Therefore, by largely ignoring the specific needs of an important proportion of children and youths who are considered potentially at risk of mental health problems or social challenges, this call to action seems to me missing a big mark as well as an opportunity to address ignored needs and improve the lives of these children and youths. Okay. It now works so i will leave my comment: just wondering what the inaction is that our call to action will answer. Can we define the inaction? And, if we can, then what is our response in solidarity? What call can we all suggest and support? A single arrow is easily broken but ten in a bundle are not. The public is encouraged to add to the development of this document by commenting below.